Get the lowdown on colors, materials, and ideas we'll be bringing home. September may be fashion month but for us, it’s all about design. While most of the world is engrossed in the comings and goings of all that comprises Fashion Week—and its related slew of events scattered throughout New York, London, Paris, and Milan—we’re looking to the design shows that are equally making their mark. Coming hot off the heels of Paris’s Maison & Objet and London Design Festival, we find ourselves surrounded by an abundance of fresh trends and ideas that are bound to take the design world by storm, especially as we look to the coming year. Naturally, given the ample sources of inspiration born from said shows and the brand new concepts unveiled just between the two events alone, we find ourselves walking away with a wealth of knowledge and ideas. From the color schemes that will come to replace the ubiquitous millennial pink to the metallic finishes giving brass a run for its money, we rounded up the design trends that will be making their mark on 2019. Read on for the scoop, plus some helpful tips on bringing it home, courtesy of our trusty interior design experts and friends. Sustainability is a movement that is becoming more widespread than ever, especially as it pertains to design—and come 2019, it will be an overarching theme that will be all too present. It has made serious headway in the realm of food and drink (stainless steel straws, we’re looking at you) not to mention fashion, but the concept of living a more eco-conscious lifestyle has become ingrained in the methodology of many designers, especially when it relates to how they approach their craft. That said, there is a lot more to the movement than reclaimed materials and upcycled basics. The idea of being more sustainable has grown to embody an all-encompassing approach to design, with many brands looking to alternate resources with which to build their basics. “We find that our approach to the things we surround ourselves with is shifting towards a longevity-focused one,” says Muuto’s design director, Christian Grosen, adding that this, in turn, is “prompting us to buy designs that will last for years into the future, both in their quality and aesthetic.” Similarly, in line with sustainable living, the idea of investing in key, standout pieces that will last the test of time, be it decoratively or simply for quality, is an approach we can definitely get behind on. Ikea is no stranger to sustainability and their forthcoming collections are simply proof of that. Having aligned itself with the idea of merging eco-friendly design with a style-focused finish, the Swedish retailer continues its thorough exploration of such, which have come to be present in collections such as TÄNKVÄRD, which will be available in Spring 2019. Boasting a series of items crafted of rattan, linen, jute—amongst various other natural materials—the line marries clean-living with the brand’s signature, Scandi-cool aesthetic. Melanie Abrantes’s line of sustainable objects and homewares fall right in line with the trend, even managing to encompass the inspired hues that will take precedence in the coming year. The versatility of the pieces of the collection is thanks in part to the natural materials of which they’re crafted with, including cork oak bark and maple wood. Every one of Abrante’s pieces is finished in a natural beeswax and are versatile enough to double as chic catch-alls, servers, and even planters. Leave it to the Scandinavians to reinvent their signature aesthetic of streamlined essentialism with a bold new detail. Whitewashed minimalism has had its moment, paving the way for the fresh wave of characteristics here to take its place. Think sleek furnishings paired with dynamic tonal qualities which, you will find are a far cry from the typical spectrum of expected shades—but more on that later. 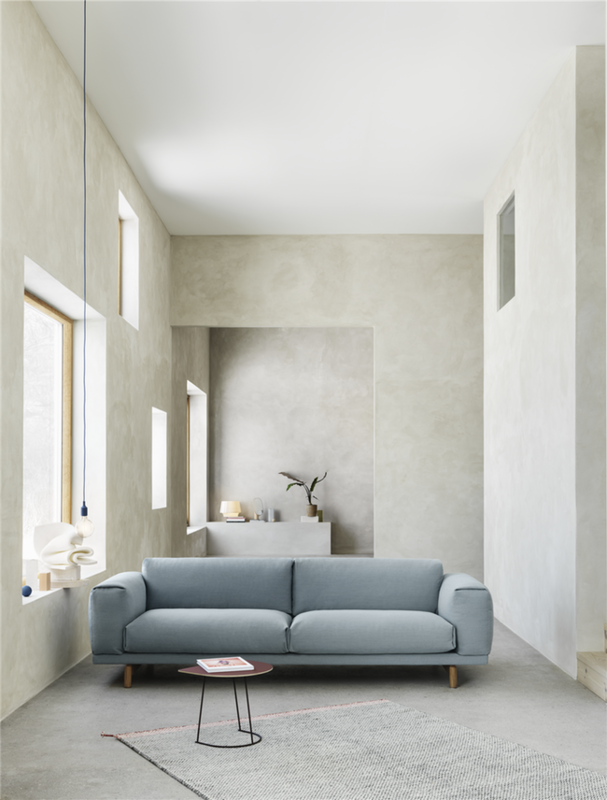 “We are working a lot with earthier and tertiary pigments in our collection for a nice color mix that can fit into a multitude of environments and paired with both simpler and more eclectic hues,” says Grosen in regards to Muuto’s upcoming collections. Said hues will translate into both furnishings and accessories, evolving into an all-encompassing feature that can fit within a wide array of decoratives styles and aesthetics. Suddenly, bringing home a bold dose of color doesn’t seem all that frightening. It’s time to rethink the traditional and how it pertains to just about every aspect of your decorative style. If there is one thing we’ve noticed in recent years, it would be the major shift from the standardized take on furniture staples—those that are reimagined with avant-garde detailing and a continuously fluid form. Sofas have been on the receiving end of this shift in paradigm, with more and more designers unveiling their unique renditions of what the living room staple should look and feel like. This one is all about thinking outside of the box, in the most literal sense of the concept—here is an excuse to retire the classic boxy piece in lieu of an alternative that promises a show-stopping element with an elevated interior in mind. The bountiful embrace of such defined shapes inspires a shift from the traditional and a welcomed one at that. Items once constricted to one particular form are reimagined with a burst of creativity. Take for example Established & Sons’ rendition of a drawer chest, which bears a striking resemblance to a filing cabinet. When was the last time you found the office staple to be the object of your desire? Keeping in line with the aforementioned trend of fresh shapes and forms, patterned pieces are also seeking a spot in the limelight, courtesy of their very own refresh. Cold Picnic, an NYC-based purveyor of all that embodies the new classic-cool, broke out on the trend with their inspired array of reinvented essentials. Here is where we find ourselves pining after a bath mat or area rug, each resulting in a double take. Brooklinen is yet another brand to get in on the trend, with their new line of bedding devoted entirely to the maze-inspired pattern play, which promises a refresh for your basics. Consider it the ultimate element of motivation to getting started on the trend. All that isn’t to say that the traditional is going anywhere. Shifting from the contemporary set, those who err towards the classically elegant can relish in the fact that the old-new is making quite a comeback. Is chrome the new brass? While we’ve wholeheartedly embraced the effortlessly chic and oh so versatile warm metal, a fresh finish is one we can never turn away from. Even though the former of the two proved to be an ideal pairing for lush velvet textiles (preferably those that entailed a cool blue or saturated emerald tone) chrome arrives on cue with the upcoming year’s standout hues that embody the warmer spectrum of the color wheel. Think deep burgundies or a soft purple with smokey gray undertones, tones that are reminiscent of a ‘70s-inspired scheme, bringing a bold dose of character and personality to the room they live in. Every year has that hue (or two), which more or less sets the tone for the items and ideas we choose to bring home. The specific color can vary by season, whereby subtle iterations of it are presented by seasonally-appropriate schemes. Consider millennial pink, the color took the design world by charge with its unrelenting grasp that lasted, arguably, far longer than most would expect. Last year, the hue yielded to the delicate lilacs which began to garner interest while others sought a reprieve and a refresh by way of vibrant yellows and primary reds. Through a natural course of tonal evolution, the latter two set the foundation for the storied earthy tones you can expect to see more of in the coming year. Orange and yellow will be two dominant hues in 2019, with moody renditions of two permeating the realm of decorative accents, furnishings, and paint. Drawing from a true ‘70s-inspired palette, you may expect to see the two integrated within one another with effortless ease. Inspired by the depth and richness of terracotta, oranges will come to embody a certain rusty quality, emulating the organic source of its inspiration. Yellows, while as bright and cheery as they may be, will come more muted in finish albeit, there will be no comprising on its vibrancy or alluring draw. On the other hand, you may also expect to see the primary color wheel implemented in its quintessential form. From iridescent to full-out rainbow schemes, the technicolor palette has made major strides in recent years. Thoughtful color blocks are one way to embrace the palette, allowing the vibrancy of each saturated tone to make a statement in its own right. Decorist designer Max Humphrey is all about the vivid hues. “Sick of all beige rooms? Me too! I’m seeing more and bolder color choices used in big ways (sofas, wall paint) and especially mixing colors that you wouldn’t think work together like navy and green, or pink and red,” he notes. To really take things to the next level, Humphrey suggests pairing said palettes with rich fabrics (enter velvet and leather), a look you’ll definitely be seeing more of in the coming year.